The James R. Thompson Center at LaSalle and Randolph streets. DOWNTOWN — Illinois Gov. Bruce Rauner plans to sell the James R. Thompson Center to a developer who might raze and replace the building, he said at a news conference Tuesday inside the Helmut Jahn-designed building. 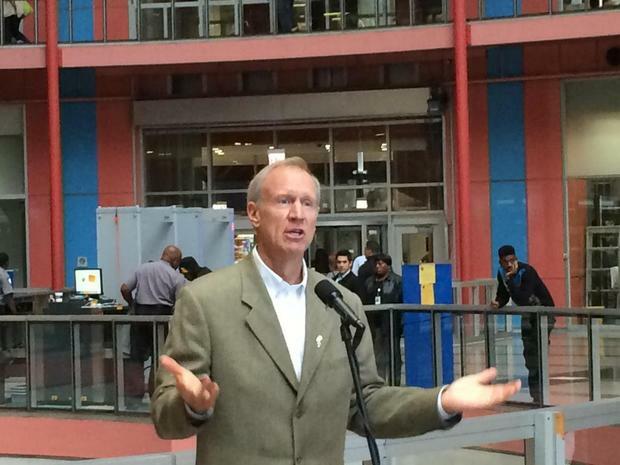 Rauner said he plans to sell the Downtown state office building via public auction. No dates have been determined, but the governor said he hopes to sell the site "within the next year or so." Calling the current building "ineffective," "inefficient" and "in disrepair," Rauner argued that the 17-story structure at 100 W. Randolph St. sits on "one of the most valuable blocks in the City of Chicago." "This is a compelling opportunity for the people of the state," he said. Rauner believes a redevelopment of the site, which also includes one of the busiest train stations in the city, would likely include new offices and retail space. Gov. 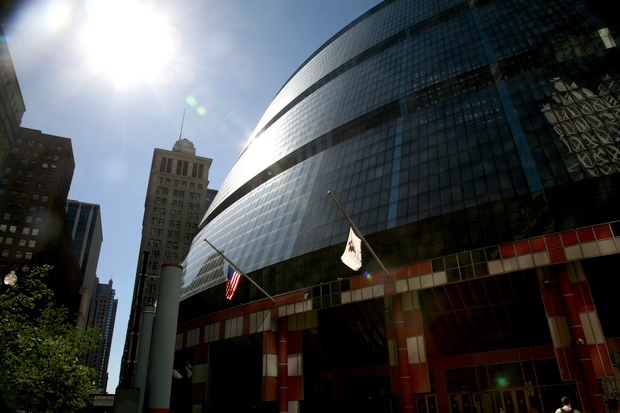 Rauner announced plans to raze the Thompson Center Tuesday. The building, named after former Gov. Thompson, opened in 1985 and is known for its distinctive design by architect Jahn. In a statement Tuesday, Jahn said subsequent state administrations have failed to maintain the building. Thompson told the Sun-Times' Michael Sneed that former Gov. Pat Quinn was to blame for "refusing to maintain the building properly." A Quinn rep told Sneed that Quinn was burdened by state finances. Remember that time Gregory Hines and Billy Crystal got in a shootout there? The Thompson Center in film. Jahn hopes the center would be re-purposed rather than demolished. "This requires upgrades to the retail and food service, marketing the large floor plates to innovative tech companies, adding parking ... [and] adding 24-hour uses: a hotel, apartments or condominiums; in short, making it the most exciting place in the city with around-the-clock activity," Jahn said. "History is full of examples where such re-purposing has brought new life to structures like this. This will require some changes be made. The building will only survive this way, and will become a landmark for the 21st Century." Rauner said current state employees who work in the building would be moved to existing state offices in Springfield and Chicago. He said closing the building, based on occupancy costs alone, would save between $6 million and $12 million a year in state spending. "We can pay people to take this building from us and still save money," Rauner said. The governor said he would welcome new construction, which he estimates could lead to approximately 8,000 new construction jobs for the redevelopment of the site, in addition to longer-term property tax revenue for local governments. When asked about the architectural significance of the well-known 1980s atrium building, Rauner said "beauty is in the eye of the beholder." "We gotta drive value to the taxpayers," he said. Rauner dismissed a question about using the Thompson Center for a potential city casino, saying that was "a separate topic," but added that the existing building would not likely be "functional for anything else" beyond its current function.